Honey bees have a good system for growing and maintaining their colonies. The colony grows, swarms when it grows too large and produces a new queen when needed. However, in beekeeping there are times when you will need to consider requeening a hive. This is a scary event for many new beekeepers. It is normal to have some apprehension. But, requeening a hive with a new queen is an important part of honey bee management. Hives with older queens are more prone to swarming – so that’s another reason for young queens. The queen honey bee is the most important bee in the colony. She lays all the eggs for the colony producing a continuing work force. The most common reason for requeening is to replace an old queen. Queen bees can live for several years. But, it is rare for a queen bee to be productive past the age of 2. As she ages, her pheromone levels begin to drop and egg laying rate is reduced. If you do not replace her, the honey bee colony soon will. the old queen is not laying a good pattern of worker brood. When Is the Best Time to Requeen? If your honey bee colony is in dire need, you can requeen a hive during any of the warm months. When given a choice, I think you will get the best results if you requeen during Summer. July-August is often thought to be a good time for new queens. At this time of year, queens should be relatively easy to obtain. And because the Spring rush is over, available queens should be well-mated. By requeening during Summer, your new queen will have several months to become established before Winter. And if you have problems requeening the hive, you have time to try again. The first step in requeening is to order your new queen bee. If you live near a beekeeping supply, they will often have extra queens for sale during the season. Otherwise, you can order a queen bee through the mail. When you want to requeen a hive, planning ahead is key. A honey bee colony normally has only 1 queen at a time. Before you can add a new queen, you must remove the old one. You may feel bad about replacing (killing) a queen who has worked hard for the colony. It may sound silly but I feel a little bad too. Still, it must be done for the good of the colony. Before you do anything to your old queen, you should have a new queen “in your hand”. Not on order, or on its way – “in your hand”. Learning how to find your queen bee is often a difficult task for beginner beekeepers. The job gets easier with time. Before adding a new queen, you must remove the old one. Otherwise, the old queen and her workers will kill your new queen! The queen honey bee’s job is egg laying. She is usually found in the brood nest of the colony. Start looking for her in the box that contains the brood nest. See my post : How to Find Your Queen Bee for tips on finding your queen. Finding her may take a while, this is a job that should not be rushed. Once you have located the old queen, you can decide how to dispose of her. 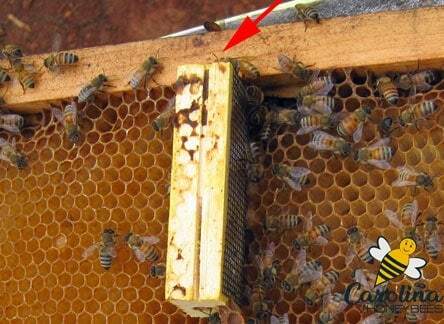 Some beekeepers squish the old queen and leave her dead on the frames. They feel that this helps the colony to realize that she is gone. Perhaps your colony is without a queen! We call this a queen-less hive. If your bee colony has no brood of any kind during the warm season, you must suspect queen problems. If you do not find any brood or a queen after several attempts, it’s time to order a new queen. A colony with a failing queen is often a bit more “testy” than normal. And, if the colony is truly queenlees, things can get even worse. Stay calm, move slowly and use your smoker to calm the bees. Because it may take a little while to find your queen, go to the hive prepared. Your smoke should be lit and you should be wearing protective gear. 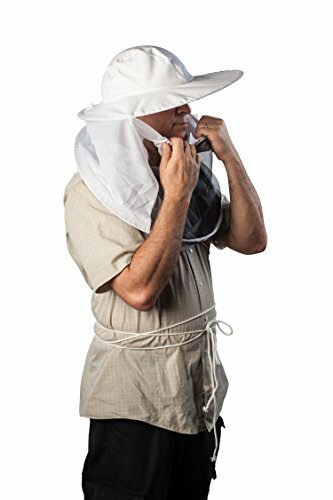 Protect your face at a minimum with a beekeeper’s veil. If replacing an existing queen, some beekeepers recommend leaving your hive queenless for 24 hours. This means you would kill your old queen and wait until the next day to introduce your new queen. I usually do not do this as it requires the hive to be opened twice. The choice is yours. Again, never dispose of an old queen without her replacement in your hand. Now it is time to talk about putting your new queen in the hive. Worker bees are loyal to their own queen. The new queen will “smell” different and is likely to be killed by the colony. This is why you need a plan to allow the workers to get to know and accept her. There are 2 common methods of queen release: direct and indirect. If the new queen is released into the hive immediately, this is called “direct release”. This is normally a really bad idea. Unless the workers are queenless and desperate, the new queen will be immediately killed. I do not recommend using this method. The other method of queen introduction is indirect. With this method, the new queen is slowly introduced to the colony over several days. This gives the bees time to accept her are their queen. Most often, the new queen and a few attendants (bees that came from her hive) are held in a small cage. A wooden “queen cage” will have a candy plug on one end. The white candy blocks the exit. If there is a cork over the candy plug, remove it. If your new queen comes in a plastic cage, you may find a cap over the candy tube. 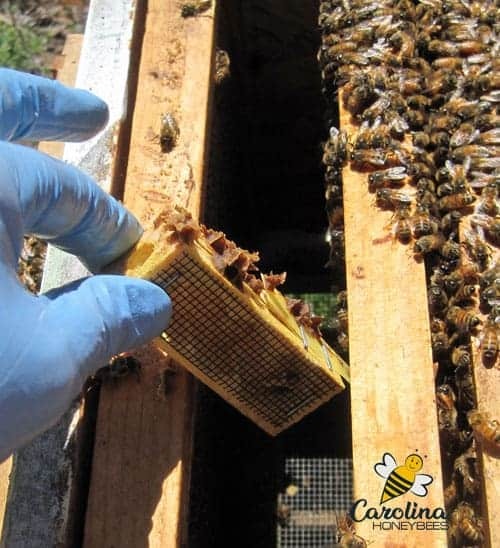 Remove the plastic cap – allowed the hive bees access to the candy plug. Over several days the bees, inside and outside the cage, slowly eat through the candy plug. This gives the bees time to get to know the queen. Some resources suggest that you should poke a very small hole in the candy to give the bees a head start. My advice is to gently test the candy plug. If it is pliable, do not punch a hole in the candy. If the candy plug seems very hard and dry, you may want to use a small nail or toothpick to make a small hole. Be careful, I can’t tell you how many new beekeepers have killed their queen trying to make a hole in the candy. All beekeepers have their own way of doing things – find what works for you. Place your queen cage between 2 frames in the bee hive. Exact placement of the queen cage is up to you. If the exit points down, workers inside the cage might die and block the exit. The candy end should point up to prevent any dead bees blocking the exit. However if you live in a very hot climate that might cause the candy to melt, place the cage horizontally. Within a few days, the candy is eaten away allowing the queen to be released. Fitting a wooden cage into a mature hive can be tricky. I like to push the cage just below the top bars and then gently squeeze the frames together just enough to hold the cage in place. 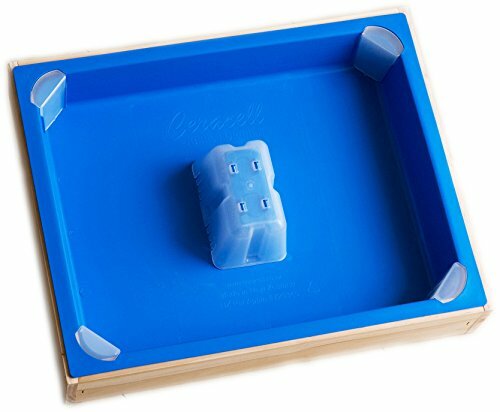 It is important to be sure that the exit hole is open between the top bars – so your queen can leave the cage. If you twist the cage so that the screen is open to hive workers, they will communicate with the new bees and even feed them. This is temporarily leave a bigger gap between your frames than normal. That’s okay. You will remove the cage in a few days. When I am using the plastic queen cages, I use the same procedure. However, I push the frames close enough together to hold the candy exit tube between the wooden parts of the frames. Consider feeding your colony when you are requeening a hive. Yes, even if a nectar flow is on. I have found my bees to be more receptive to a new queen when food is plentiful. Choose the type of feeder that you prefer to use and give your colony some 1:1 sugar water. This recipe is equal parts of pure cane sugar and water. To avoid stressing the colony, wait 7 days after cage placement to check the hive. If you see the new queen walking around on the comb, she has been accepted. Seeing new eggs that she has laid, means you have been successful at requeening your hive. Now, the queen cage can be removed and the frames pushed back together properly. If you do not see eggs, check again 3 or 4 days later. Sometimes, the new queen needs a little time to settle down and get to work. Requeening is a necessary beekeeping management practice for those who want to grow productive hives.